We are the national governing body for squash in England, and lead the development and delivery of the sport on both a national and local level. We strive to help the sport grow and work collaboratively with our partners and stakeholders to provide engaging opportunities, from developing grassroots programmes and resources to producing world-class athletes. 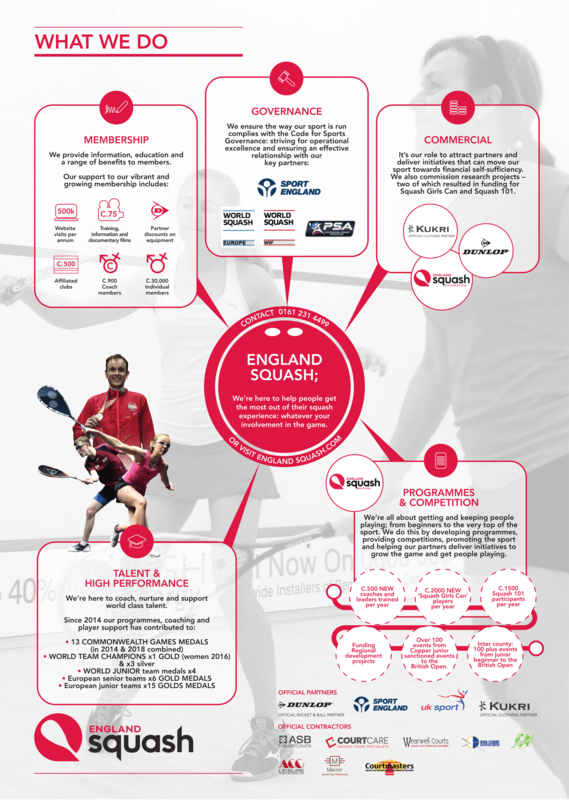 More than 200,000 people in England play squash each week in more than 4,200 facilities with squash courts. We help more than 500 affiliated clubs to prosper and create thriving squash communities. We provide and support competitive opportunities at an international, national, area and county level for all ages and abilities from the Dunlop British Junior Open to the Allam British Open. Through our talent pathway, we identify and develop the country’s most talented squash players through their amateur careers, many of who go on to flourish on the world’s stage including former World No.1 Laura Massaro and three-time World Champion Nick Matthew. We’re proud to support a vast network of qualified coaches who we train and develop to deliver the sport on a local or national level. We are supported by an incalculable number of dedicated volunteers at club, county, regional and national level who we celebrate annually through our Workforce Awards. Our values flow through everything that we do. They define who we are, what we stand for and set the expectations of those we work with and those who partner with us. They have been defined by our employees and are integral to our journey. Connecting: we will support and grow the game to encourage and engage with everyone; irrespective of social background, ethnicity, ability or gender. Driving: we will always seek to inspire and be inspired by the game whilst ensuring that we focus all our efforts on delivering our current strategy. Adventurous: we will constantly push ourselves to provide creative solutions to our challenges - building on all available insight. 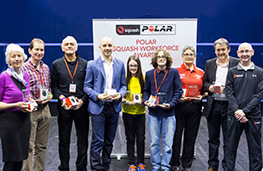 England Squash is committed to diversity in all aspects of its business and activities and at all levels of its management. Specifically, the Board fully supports the need for a board of directors which reflects gender, ethnic, disability and skills-based diversity, so as to best be able to address the evolving needs of England Squash and its members. The Board has adopted Sport England’s sport governance target of a minimum of 30% of each gender on its Board and is committed to progressing towards gender parity. 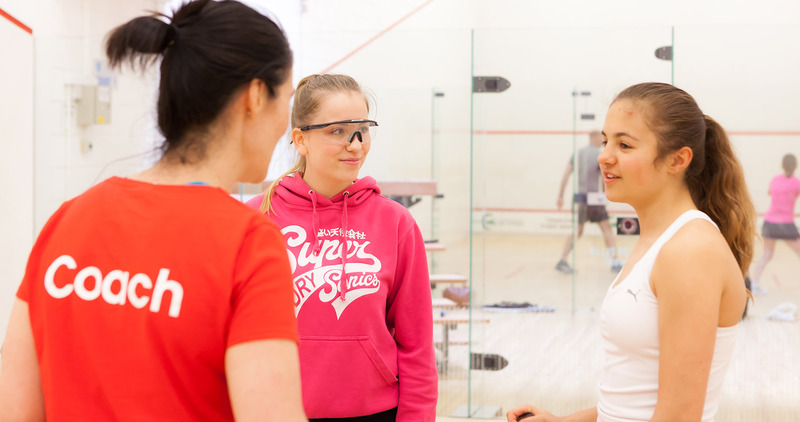 In order to remain as transparent and informative as possible, the Board will publish information on the England Squash website to demonstrate how such diversity is being fostered and developed. Find out how we celebrate and recognise our amazing volunteers.